'The Walking Dead' Season 7 Premiere Victims Revealed! ‘The Walking Dead’ Season 7 Premiere Victims Revealed! All summer long, Walking Dead fans have waited (some more patiently than others) to find out who suffered Negan’s bat in the Season 6 finale. At long last, Season 7 has officially arrived, and with it came not one, but two victims fallen to Lucille! Find out who bit the big one in Sunday’s premiere! 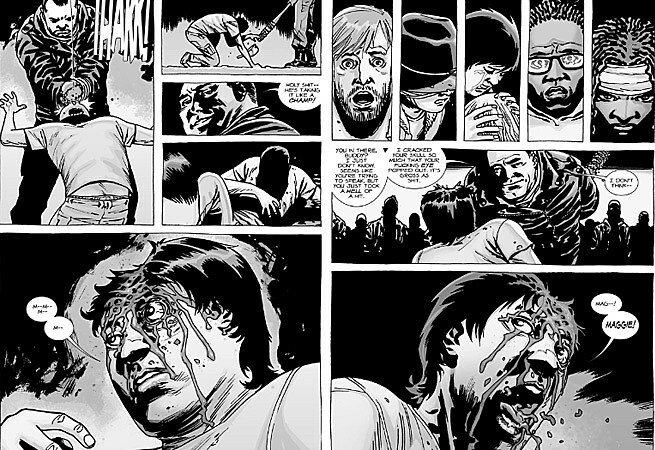 None other than the original comic character to suffer Abraham’s fate, Glenn! Yes, it seems AMC had in mind to have its cake and eat it too, keeping us all guessing which character would replace Glenn, only to circle back and kill him off as well. Of course, both characters have more or less been marked men since Season 6, after Glenn’s infamous dumpster dive, and the fact that poor Denise wound up catching the arrow that was meant for Abraham in the books. There’s plenty more to take in, including how Rick very nearly chopped off Carl’s arm, and the fact that Daryl will be spending a good portion of Season 7 in the company of Negan, but did poor Abraham and Glenn’s deaths satisfy the months-long wait? Stay tuned for our full review of tonight’s Walking Dead premiere. Source: ‘The Walking Dead’ Season 7 Premiere Victims Revealed!